As the northeast transitions from fall to winter, watch for changes in Parks lakes and ponds nearest you. You might notice that the water churns more than it did during the summer, or you might even notice ice beginning to form at the surface. Such phenomena can mean exciting happenings deeper in the water. One of the most fascinating changes to observe is lake-turnover, or the mixing of cool and warm waters. Lakes that turn over twice a year are known as “dimictic”: di=twice, mictic= mixing. They are one of the most common types of lakes on Earth. Dimictic lakes freeze in the winter and melt completely by summer. These lakes mix during the spring and fall, after ice melts and before ice forms. Examples of dimictic lakes are seen across New York State, including Shaver Pond in Grafton Lakes State Park, Moreau Lake of Moreau Lake State Park, Lake George of the Adirondack region, and Lake Erie. 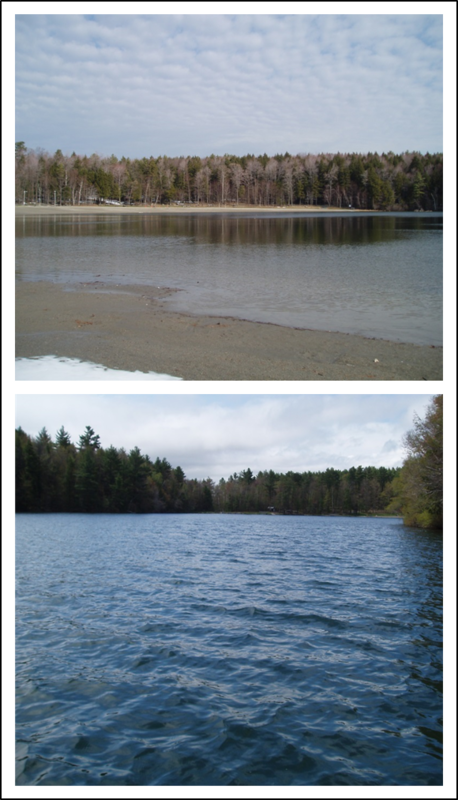 Long Pond at Grafton Lakes State Park during spring turnover: ice melting after winter (top), followed by water mixing into the lake (bottom). 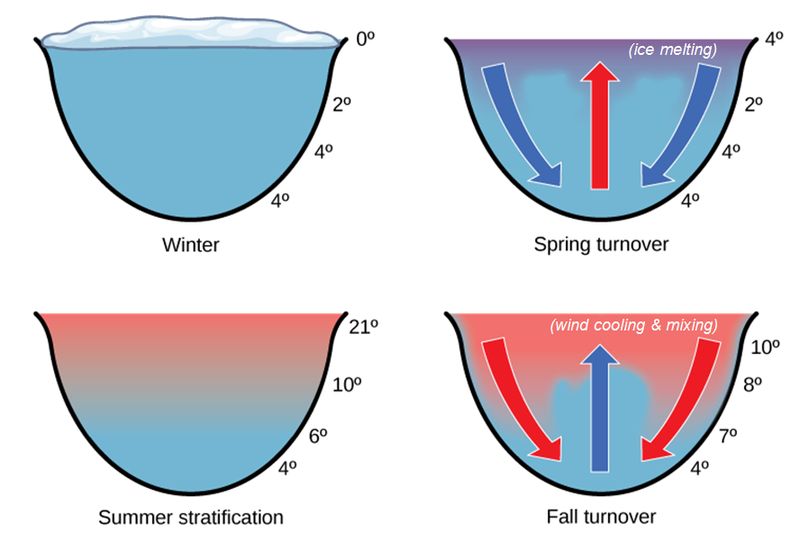 Fall turnover is the opposite: water mixing followed by ice forming in early winter. Ice photo by OPRHP. Mixing photo cropped from original by L. Schelling, OPRHP. Without turnover, aquatic life in different areas of a lake may not have enough oxygen or nutrients to thrive. Calm waters tend to separate into layers – with denser, “heavier” waters sinking below less dense surface waters, creating an invisible boundary through which oxygen and nutrients cannot pass. Water is most dense 4 degrees Celsius above freezing (4 OC, or 39OF) and becomes less dense as it cools or warms from this point. In the summer, this means warmer water is at the surface, closer to the air and thus richer in oxygen for fish. Meanwhile a layer of cooler, 4oC water settles at the bottom – where many nutrients accumulate, but also where decomposition of dead animals and plants can lead to little to no oxygen in the water. Dimictic lake temperature throughout the seasons, with the layering (“stratification”) and mixing of warmer (red) and cooler (blue) waters. Spring turnover results from ice melting, and fall turnover results from wind chilling and mixing surface waters. Image adapted from Figure 44.10 in “Ecology and the Biosphere” (Candela Learning). As chilly, windy fall weather kicks in, some of the oxygen-rich surface water can cool, sink into the lower levels of the lake, and push the deeper, nutrient-rich waters up closer to the surface. The result is a well-mixed habitat for fish. In dimictic lakes, this turnover happens again in the spring, when the surface ice melts to that heavier, 4oC water and mixes into the deeper waters. Why are some lakes dimictic and others not? One reason is lake location — dimictic lakes are more common in temperate regions with warm summers and cold winters, where lakes may freeze over completely. Another factor is lake size. Two lakes that are famous for not having complete mixing are Round Pond and Green Lake in Green Lakes State Park. These are the rare “meromictic” (mero=part) lakes which mix in the upper waters but are too deep to allow surface and bottom waters to mix. Alternatively, some lakes may be so shallow that they mix frequently (“polymictic”). NY Natural Heritage Program describes 7 different types of lakes in the state. Seasonal turnover is important for lake recreation as well as for fish and plant life within lakes. Fishing can improve near the end of mixing periods in lakes that experience turnover, since now oxygen and nutrients will be better distributed throughout the water. Many fish and aquatic life are sensitive to changes in their habitat – oxygen and nutrient levels, as well as temperature changes. Keeping an eye on the changes in the water is useful to biologists and park enjoyers alike. Post by Erin Lennon, State Parks Water Quality Unit. “Ecology and the Biosphere” from Candela Learning. Green Lake is a rare meromictic type. Thermal stratification & the effects of a change in temperature on aquatic organisms.